I want to first of all thank all the girls who participated in the shamrock hunt! I hope you all had a great time and had a chance to see some wonderful pages that are in our webring. Congratulations to all of you who found the five hidden shamrocks! You can pick up you award graphic right here. Way to go SAM! 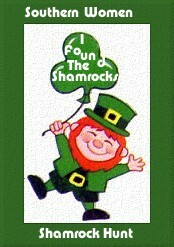 You were the first one to find all 5 shamrocks! Click on Sam's name to visit her site!!! THE EASTER EGG HUNT IS NOW ON! Starting today it is now your mission, should you choose to accept it, to find our 5 hidden Easter eggs. They are hidden somewhere on 5 of the 10 sites listed here. Remember, they can be anywhere! And as the girls will tell you from last month, they are hidden very well. Starting on the 10th, if nobody has found all the eggs, I will email you one clue per day to the main URL of the 5 pages where you can find them. Once you figure out which website the clue is to, then you are on your own, happy hunting everyone! To be included in the clues list, please email me Myakka@strato.net with clue in the subject line. At last, here they are, a list of 10 sites where the easter eggs might be. There is a total of 5 hidden, only one per URL though. As soon as you find them all please email me with the URL to the page where you found them. We seem to have had another great month of the secret sister game, after we got off to a tad of a bumpy start. (all my fault, I know, and I apologize for that) For those of you who might be intersted, here is how we play the game. First of all email us at southwoman98@yahoo.com with secret sister in the subject line. Your name will be added to the list. Please be sure to include the URL of your webpage. Each month we will rotate, you will be sender one month and a giver the next. If at anytime during the month, you are for any reason unable to continue in the game PLEASE let me know asap so we can reasign your secret sister. Please try to send something a couple times a week to your sister so she knows you are thinking of her. It can be a card, or a psp graphic if you happen to enjoy that, a recipe, a virtual vacation, or just about anything you want to. For those of you who are new, you can set up a free email address at places such as yahoo, angelfire, or hotmail to send stuff to your sister so she won't know who you are. Be creative about your secret name, sometimes they can really be cute! Please let me know during the month if your email address changes, or your webpage URL, or if you are not getting anything from your secret sister. Sometimes it is nice to send your sister a note and let her know you are getting her gifts to you also. Now the moment you have all been waiting for and asking all month long......who was my secret sister????? Mary Bear...Venus sent you that wonderful virtual vacation! If you want to be in next months secret sisters, please email me at myakka@strato.net. Let me know if you want to send and recieve or just be in one hat for the month.